Hello friends!! 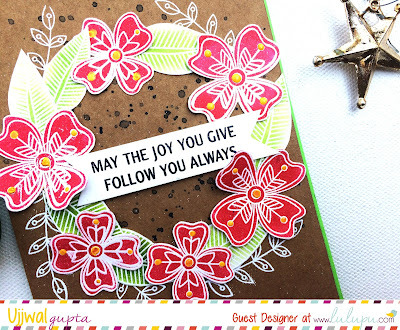 This is Kanan and I am so excited to guest designing here at Lulupu blog as a creative team member of Mudra Crafts Stamps. 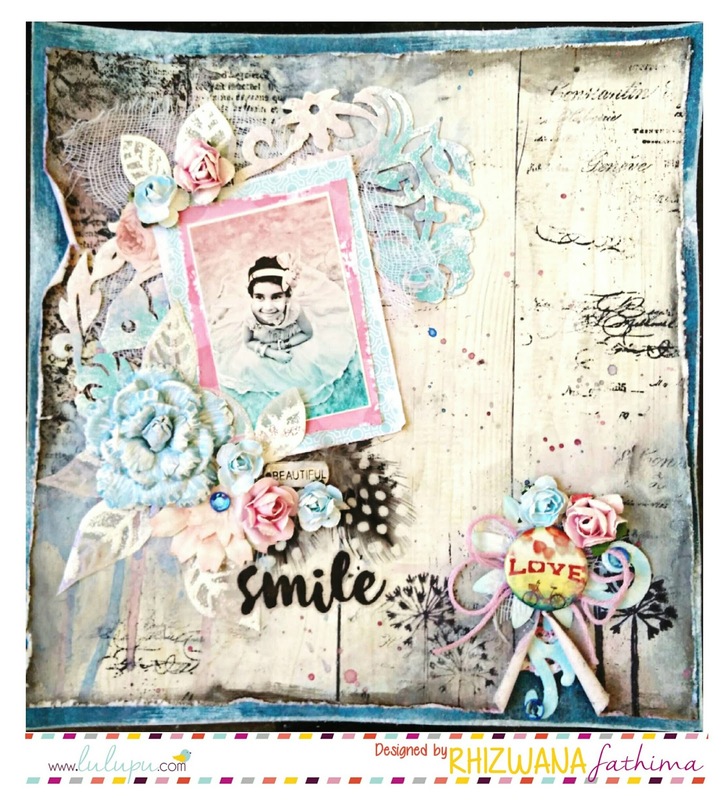 Today I will be showcasing three cards and a tag using some of the beautiful stamp sets by Mudra. I hope you all will like my creation. First I used few Distress inks in the very light shades of pink,yellow and blue and used the ink smooshing technique and colored the background. 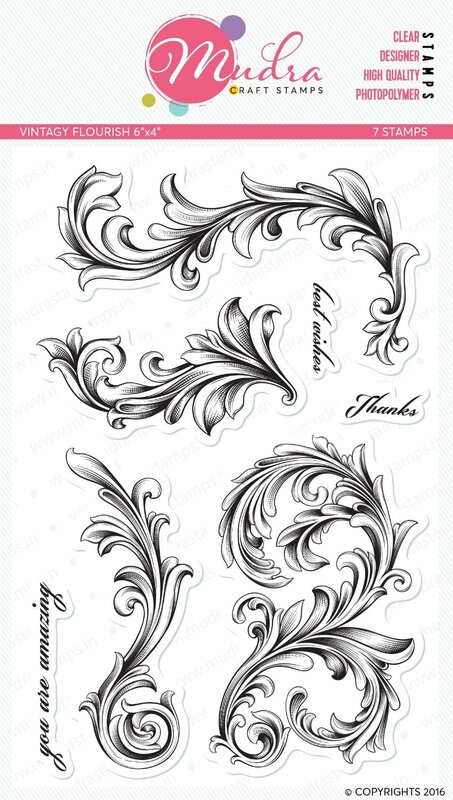 I then white and clear embossed the “Damask “set on some of the area of my background. 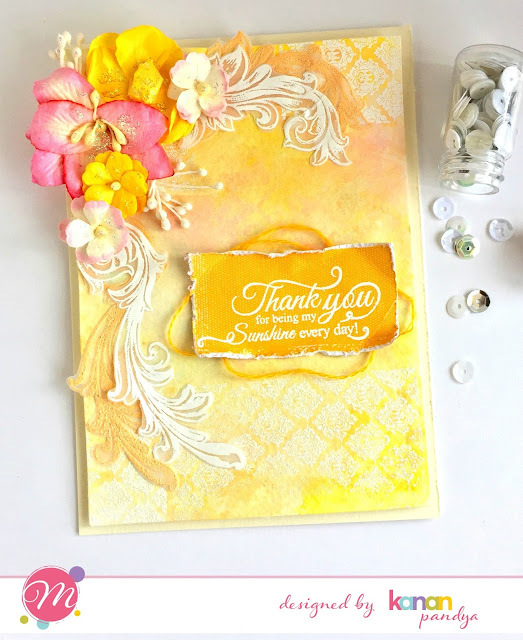 After that I used “Vintagy Flourish” on vellum and used “Dried Marigold” Distress Embossing Powder and White embossing powder. Finally added some flowers and assemble everything on the card panel. The sentiment is by “Peony Love “ stamp set which I white embossed. 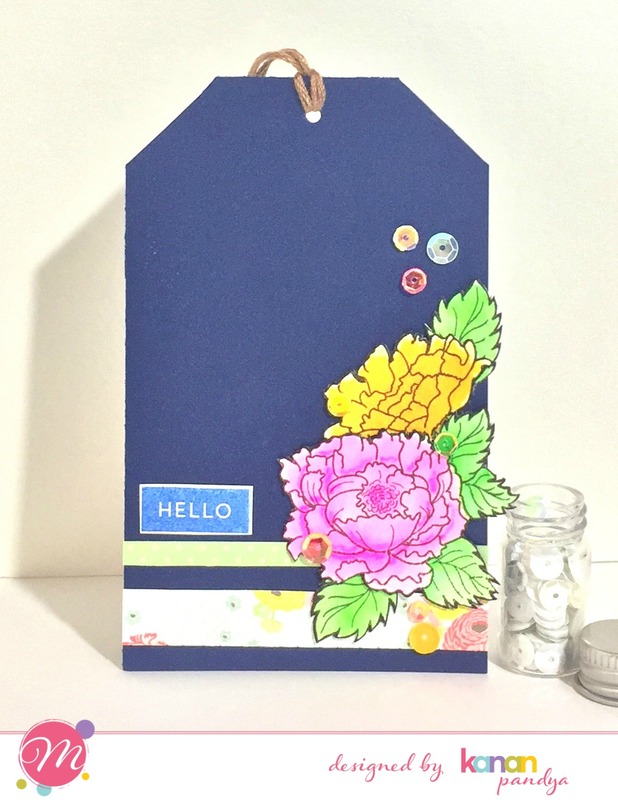 Lastly added some stickles on the flowers and my card was finished. I love the Mixed-media and sort of shabby chick look of this card. 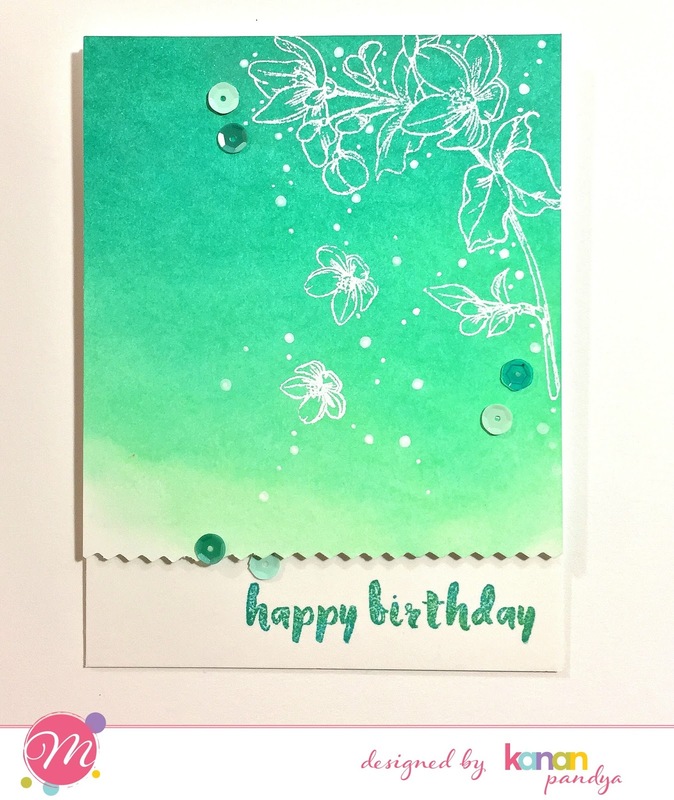 For This card, first I inked the background using Distress inks. After that I white embossed the floral images from "Dainty Blooms"
For some extra interest I cut the border of the top panel with a pair of scissor which was having triangle banner kind of design. The Sentiment is from "Brushed" set which I stamped using two different shades of Memento ink to match the background. Lastly added the panel on the main card base and added some sequins and also added some white dots with gel pen. 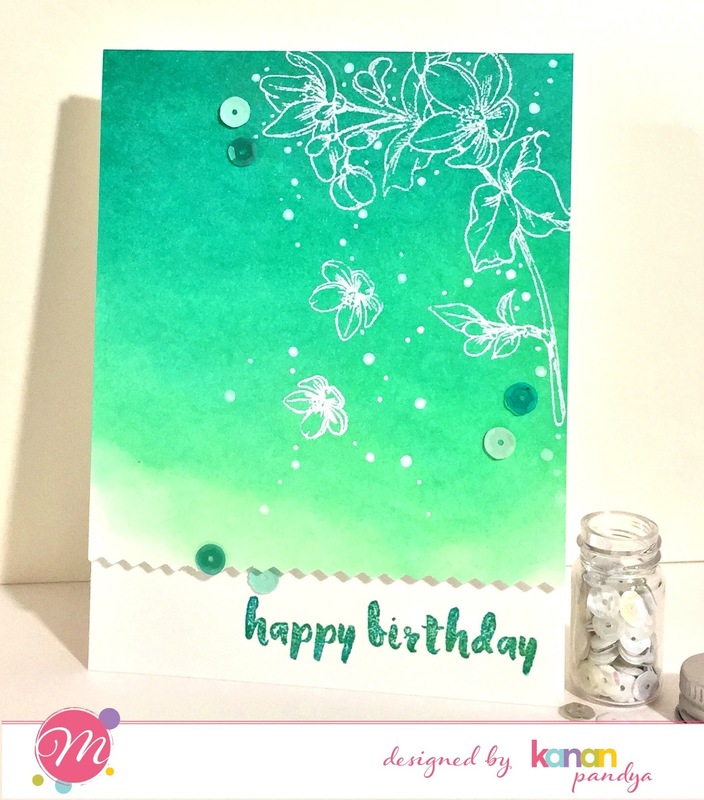 I love the cool shades of green and blue against the white embossed flowers. 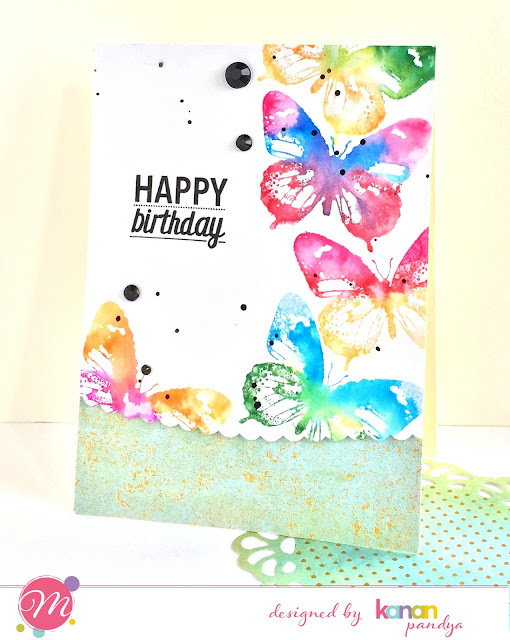 For this card I used the butterfly from the “Beautiful Butterflies “ set. Then, I inked using various Memento inks. I wanted to use the water, but I was not using watercolor paper and also I did not want that intense watercolor look and that’s why I inked the image using various shades of Memento ink and spray lightly with water and stamp directly on the paper. I hold the image on paper for few seconds so the inks with water will get absorb in it. 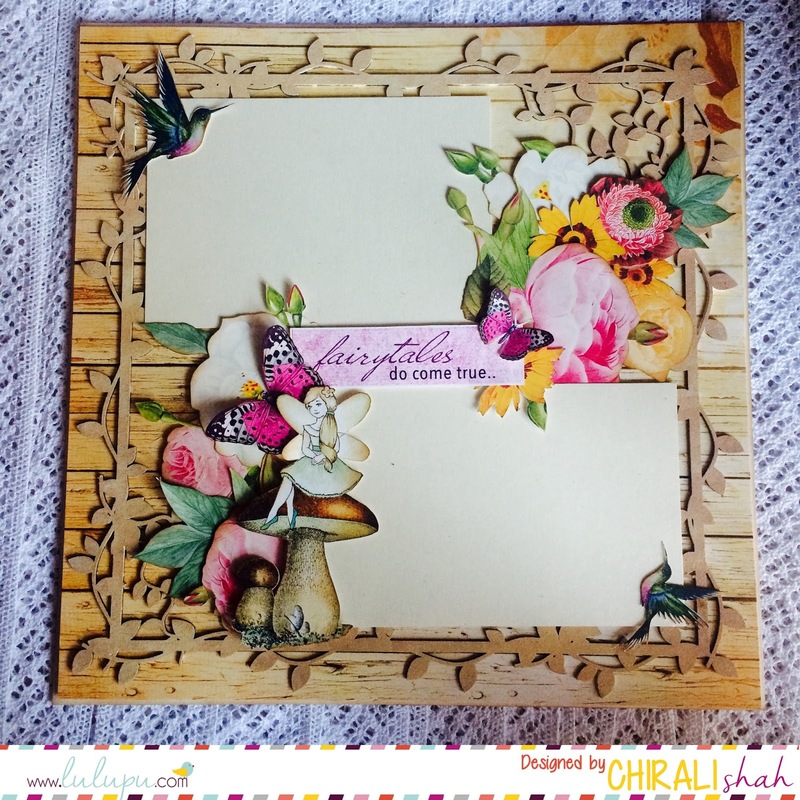 I repeat the same using various inks and stamped few more butterflies on the panel. On the card base I adhered a patterned paper which was having very light blue and yellow colors. 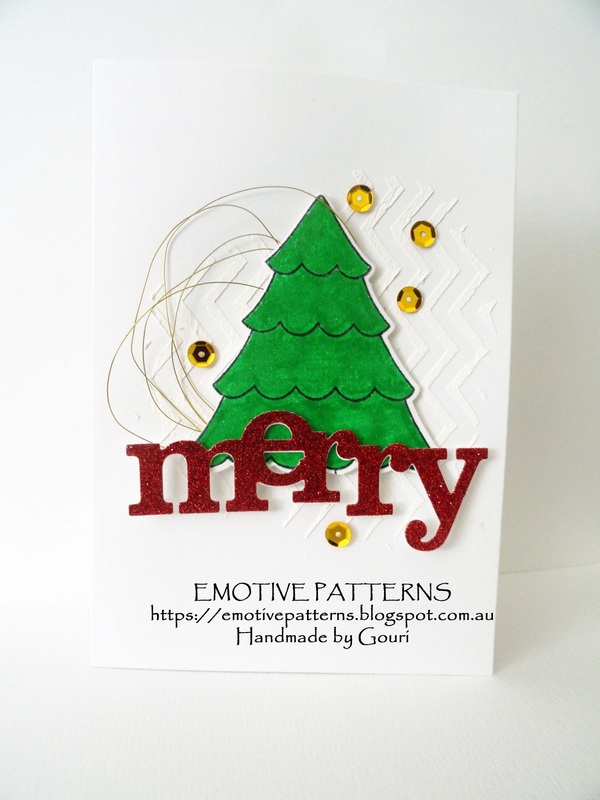 To give more interest to the design, I used the scalloped edge scissors and cut the bottom edge of the top panel and adhered the whole panel on the card base. 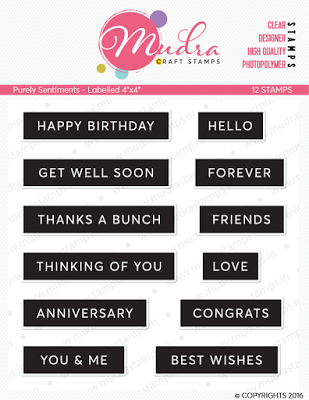 Finally, added the sentiment which is from the same set and some gems. 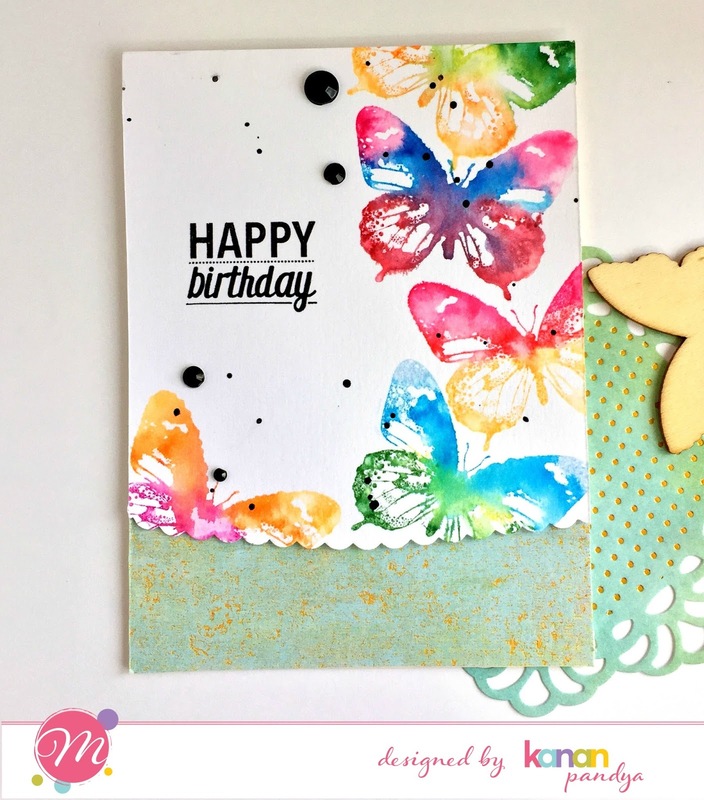 I love those bright butterflies with very soft watercolor effect. I water-colored the floral images from the "Peony Love" set using Distress inks. On a navy blue tag I added two strips of patterned paper and on that I arranged the flowers and leaves. 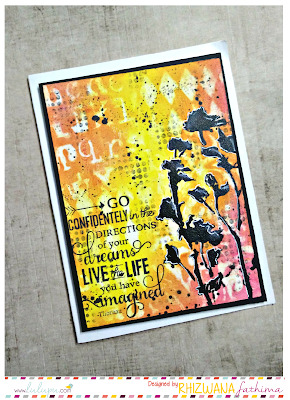 The sentiment is from "Purely sentiment- Labelled"
I love the bright color combinations of this tag and the loose watercolor effect. Hope you like all my cards and get some inspiration. If you have any question please let me know in the comments. Thank you Lulupu team for having me today. Sindhu here. We are sorry for being late in announcing the winners of our December challenge. The challenge was to use Green, red and gold colours on your creations. 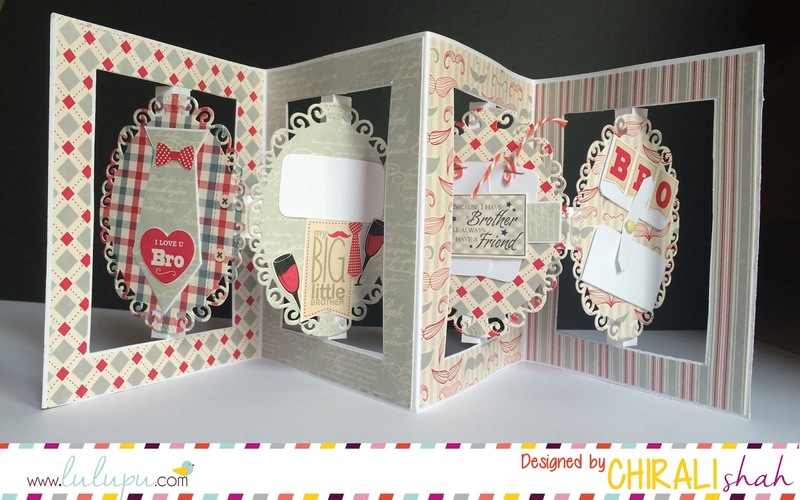 Shivani's card is so much fun! 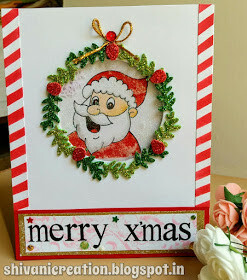 We absolutely love the Santa's image and wreath. Gouri's CAS design is so beautiful! 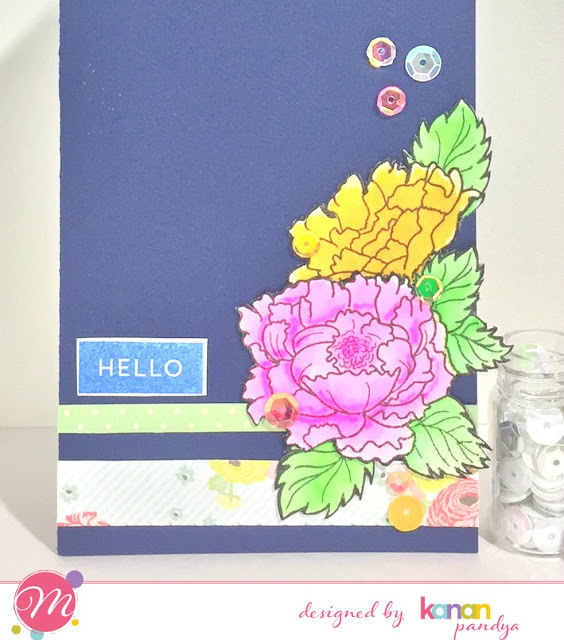 We love the subtle texture on her card! 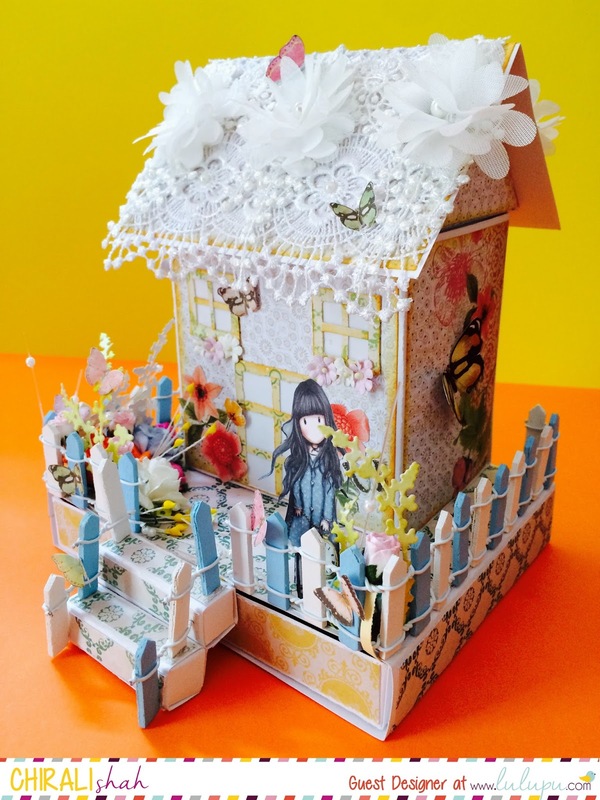 What a fantastic cascading card by dotstolines! 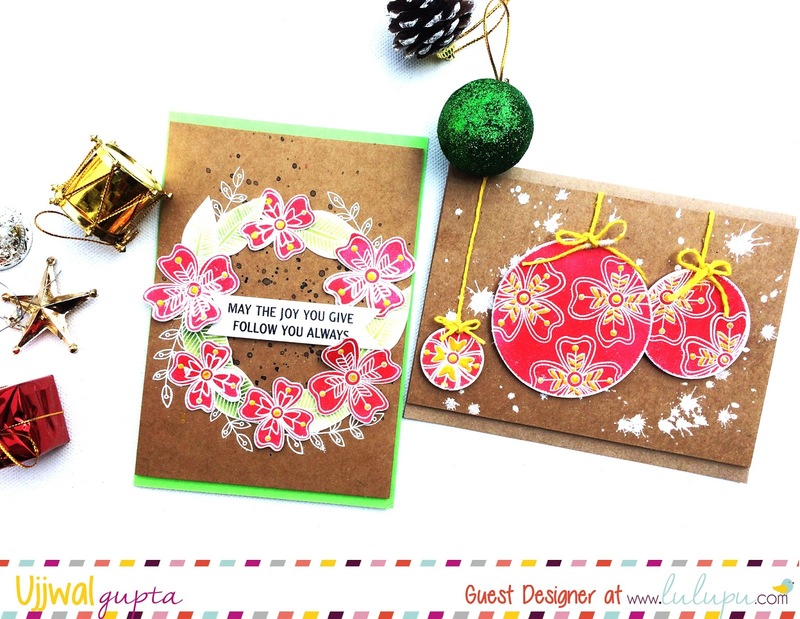 We love all the festive elements incorporated here! Ria's card is absolutely striking! Her CAS design had our hearts at the first look! 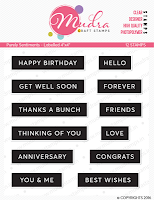 Ria, please write to hello@lulupu.com to claim your prize. Thanks to everyone who played in our challenge! All your creations were so good and it gets always tough to choose justba few. 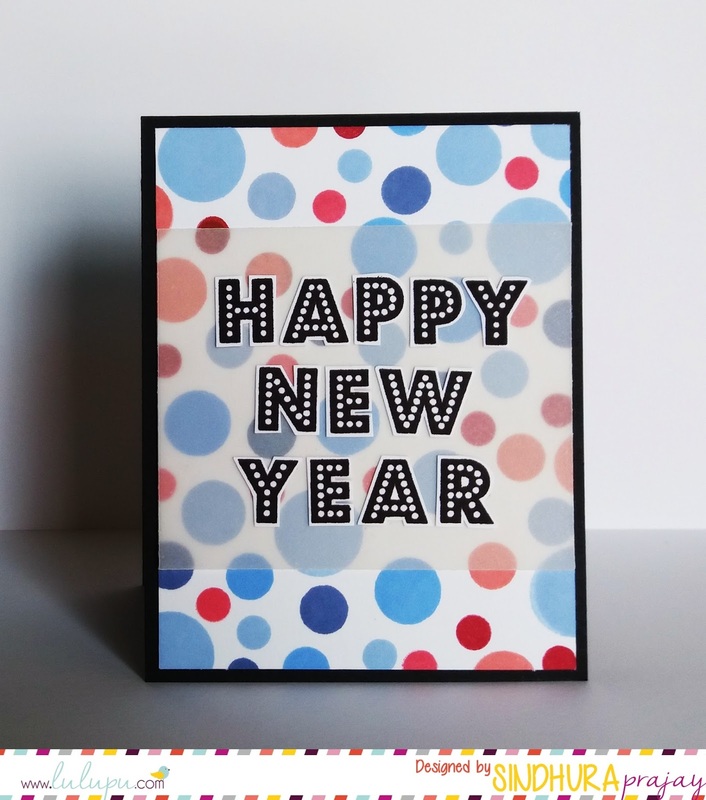 Happy New Year and a giveaway!! 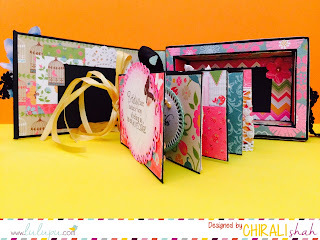 Sindhura here and I'm sad that today's post is going to be my last post for Lulupu. I want to thank Karuna for being so understanding and generous through out the term. 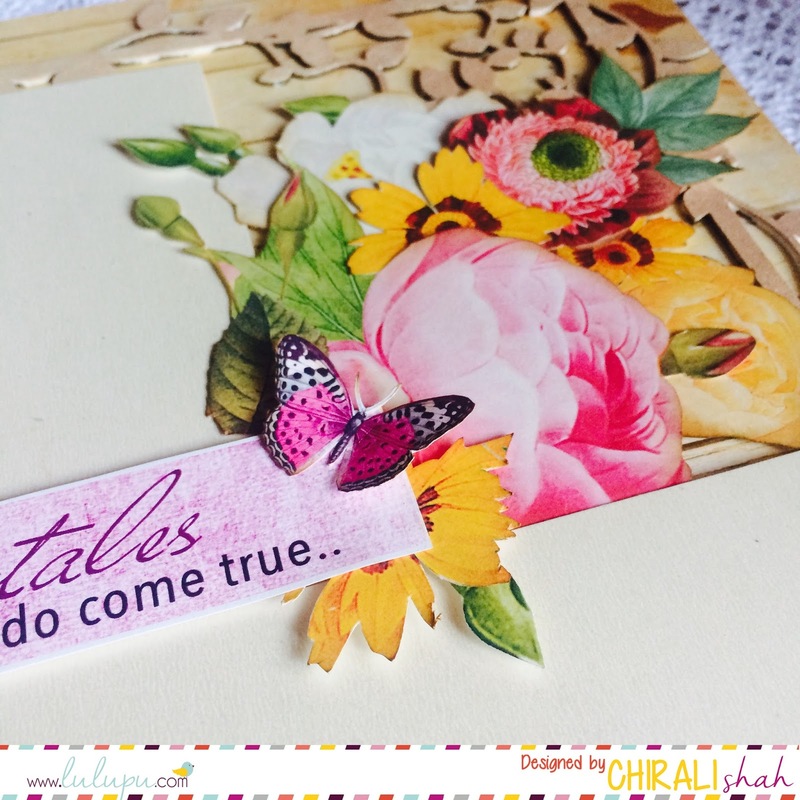 Also thanks to my teamies Rhiz and Chirali for always being their to swap posts and fill in with an extra post whenever required. Thanks for being so kind, girls! Also to each and everyone of you who visited and left beautiful comments...thanks a ton! 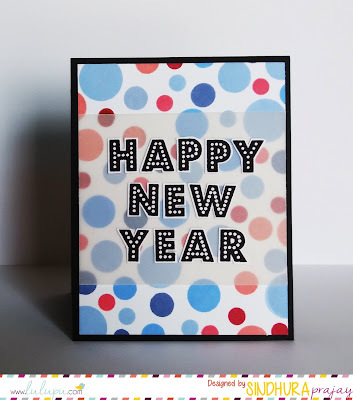 For today's post I have a simple and fun card to wish you all a very Happy New Year. :) I hope this year turns out to be wonderful for each and everyone of you and may all your dreams come true. 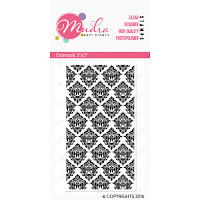 I used a Hero Arts stamp set im my stash to stamp those solid circles and then stamped the alphas from a Mudra stamp set called Decorative Alphas on a separate piece of cardstock and fussy cut them out. Then, I adhered the alphas on a piece of vellum and adhered it on the stamped panel. Isn't it fun and simple? I hope you give it a try. You can use any solid images for this effect. 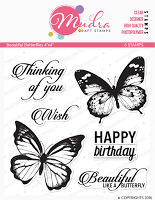 You can also use a lot of colours for stamping images. It would be even more fun. To show my gratitude, I decided to giveaway a Rs.500/- gift certificate to one of you. Here is what you have to do..
3. Leave a comment on this post telling me what your resolution for the new year is. You have until 15th January, 2017 to comment. I will pick a winner randomly after 15th Jan. Keep checking after 15th Jan for the winner announcement in a post on Lulupu blog. Thanks for everything! Stay blessed. I have a mixed media card and a small tutorial on how to create cool backgrounds with gelatos and stencils.. Apply one to two coats of gesso on the surface you are working on. This is crucial to get beautiful results..
After the gesso has dried, apply gelatos in the desired color combination. It doesn't have to be perfect.! Place the stencil on the desired position (Here i have used the large stencil from Mudra so that it covers all of the surface). Use a wet baby wipe to wipe off the color through the exposed area of the stencil. Gelatos are not permanent. So it's better to seal it with gel medium. And the background is ready.! 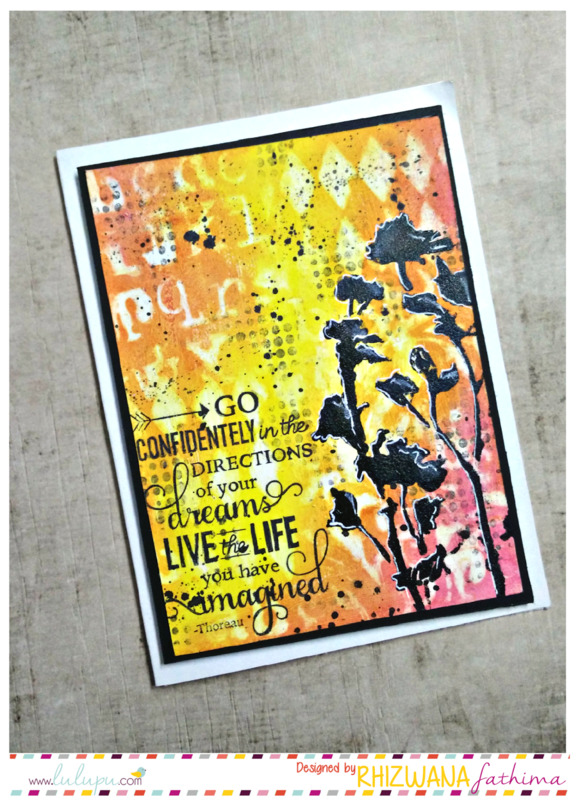 Use different color combos and stencils to make beautiful backgrounds. 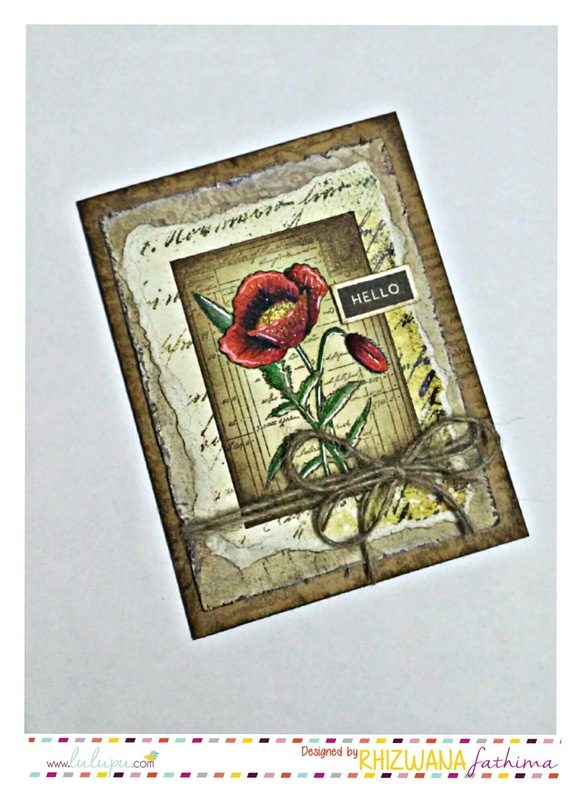 Here's a mixed media card I made using the same technique.. 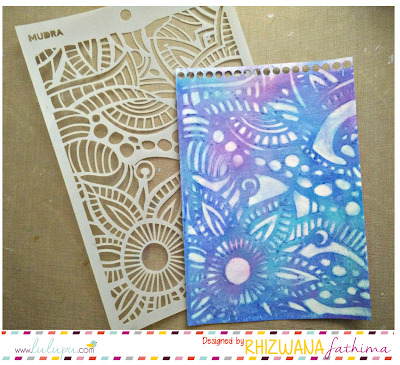 Here i used multiple stencils.! 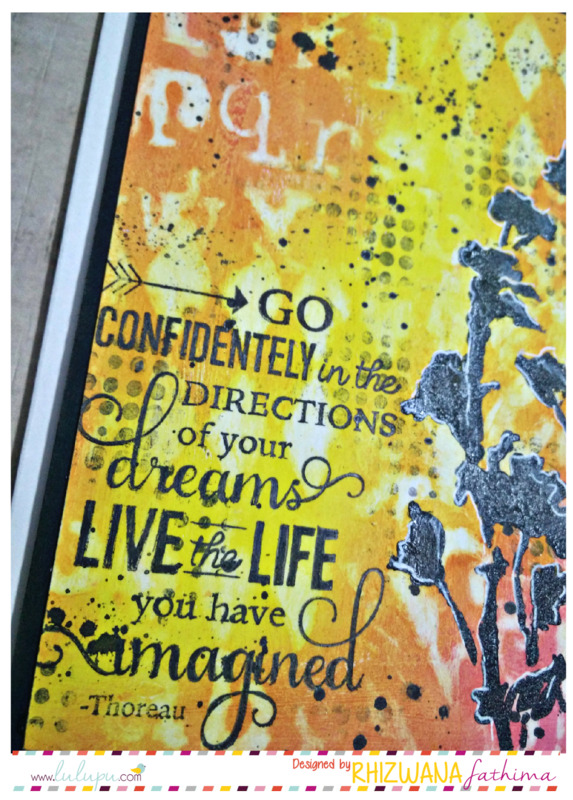 Sponged acrylic paints through stencils for the focal point, sentiment is from Mudra stamps. Sindhura here and I'm thrilled to introduce you to our lovely guest designer, Ujjwal Gupta. I totally love her style and her recent paintings are just jaw dropping! Here is a bit about her... she answered a few questions for us to get to know her better. Hello, My name is Ujjwal and I live in Pune, India with my husband and a 4 year old daughter. I have a Masters degree in Computer Application and have worked in a multinational company as a software engineer for a few years before calling it quits. Now I work full time as an artist, doing what I actually love. I have been into arts and crafts since I was a little kid. 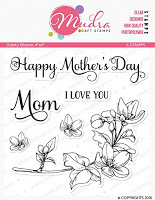 I volunteered to make charts and banners in school, would help my friends with their biology class diagrams and always made handmade cards for my family and friends. I discovered the world of blogging when I started working as a software engineer and I was hooked. It was one of my best friend's idea to start my own blog and I am so thankful to him for pushing me in that direction. 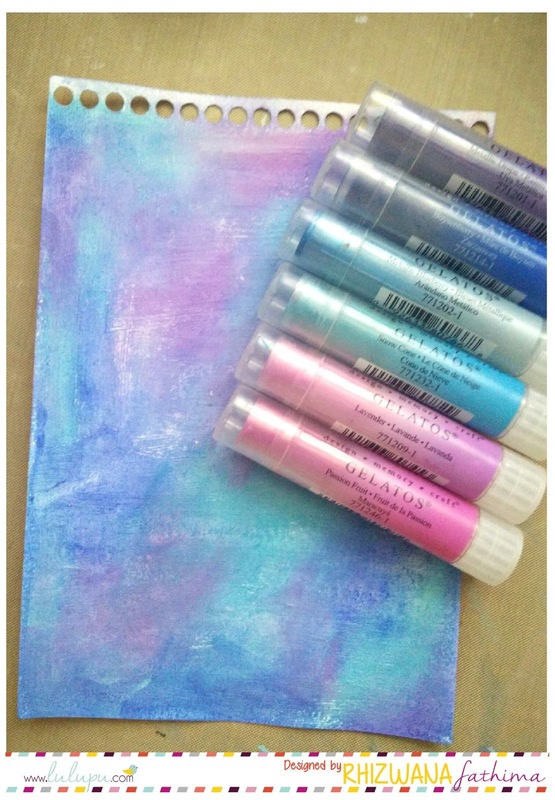 Watercolors and stamps are my favorite go-to supplies at the moment. 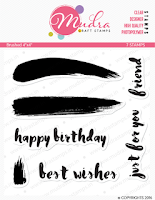 I love stamping. 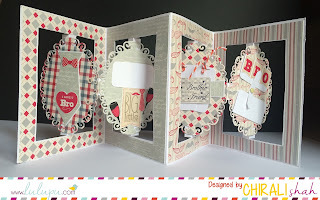 Stamps are so versatile and there's so much you can do with them. 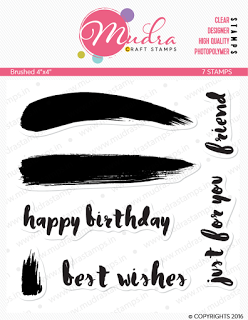 Stamping was what intrigued me the most when I discovered blogging and it still remains my favorite till date. I like clean and simple style with pops of color. 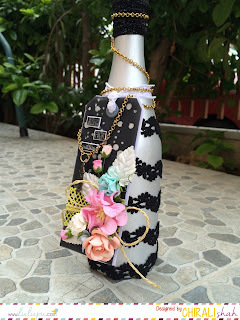 I have been crafting since I was a kid and officially blogging about it since past 8 years. Clean, simple and full of colors. I have met so many wonderful people in this beautiful journey even if virtually. There are so many people who do beautiful work and are great in one thing or the other. It would be tough to name just one but I genuinely follow them all to stay inspired. A super active 4 year old is handful and takes up most of my time. Also, I love gardening, cooking and travelling. Currently on my table is a commissioned order for a pregnancy journal. This is Ujjwal and I am so excited to be guest designing today at Lulupu today! Since holiday season is here, I wanted to share some ideas of creating holiday cards with non-holiday stamps that you might already have in your stash. My trick for using non-holiday stamps for holiday cards is to use the holiday colors and incorporate holiday elements. These are the two cards I created today and I have step by step instructions for you to follow and make your own cards for family and friends. 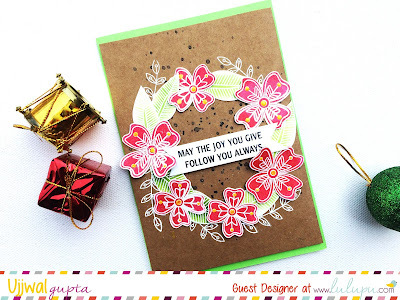 Step 1: Cut kraft cardstock to 3.75" X 5.5" and draw a circle as a guideline for the wreath. 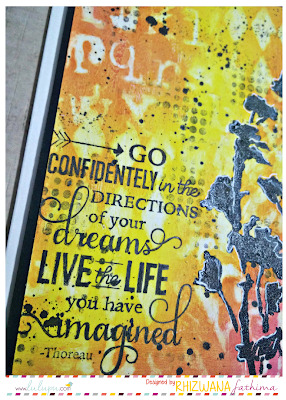 Step 2: Using black watercolor and paint brush, add a few splatters and let dry. Step 3: White heat emboss the small leaf a few time along the circle guideline on the kraft cardstock. 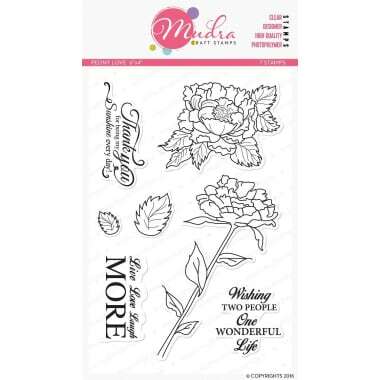 Step 4: On white cardstock, white heat emboss the flowers and other 2 leaves a few times. 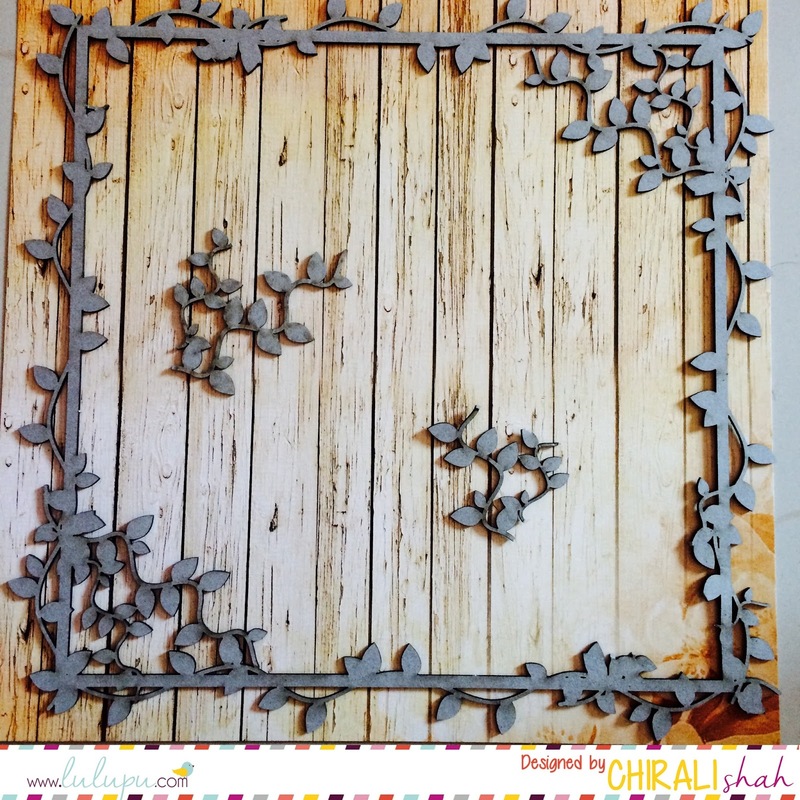 Step 5: Color the flowers and leaves using distress inks and a sponge dauber. 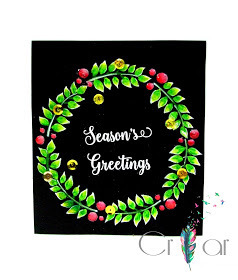 For the flowers, I used Festive Berries Distress ink and for the leaves I used Twisted Citron and Mowed Lawn Distress ink. Step 6: Fussy cut all the leaves and flowers. 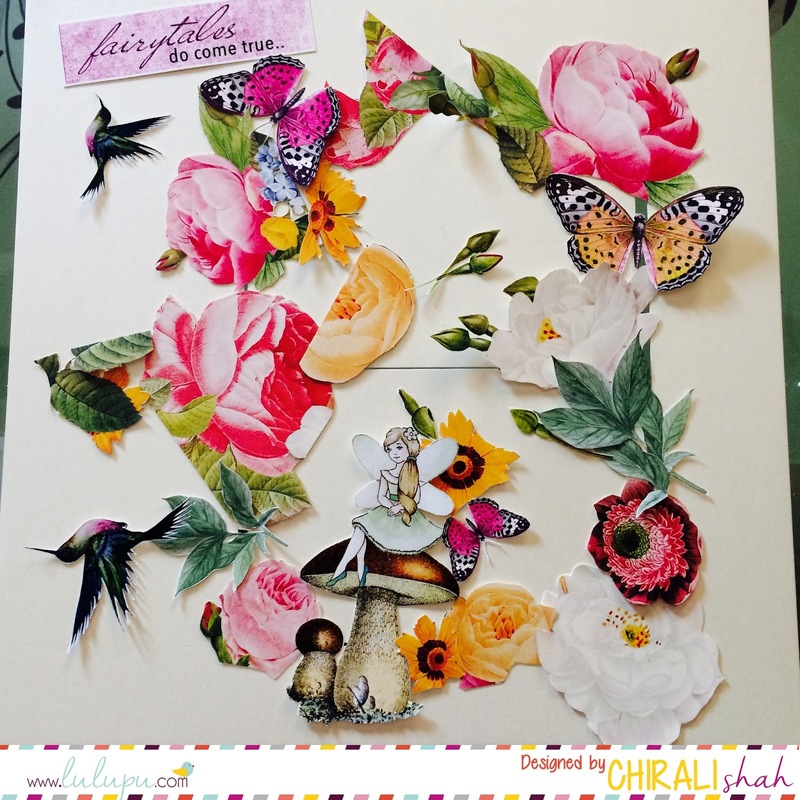 Step 7: Arrange the flowers and leaves in a wreath following the circle guideline and adhere in place. Step 8: Stamp the sentiment using black Archival Ink and nestle it in the center of the wreath. Step 9: Mount the Kraft card panel on a green card base using foam adhesive. Step 10: Add yellow accents on the flowers using Ranger Enamel Accents. Step 1: Cut kraft cardstock to 3.75" X 5.5"
Step 2: Sprinkle some water and add white embossing powder. 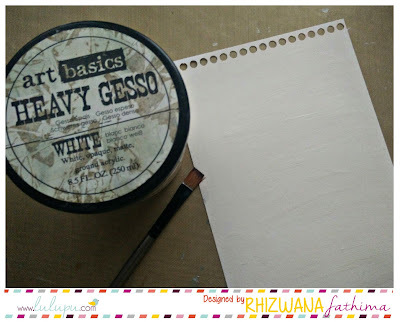 The embossing powder will stick to the white areas. Heat set the embossing and set the panel aside. Step 3: On white cardstock, white heat emboss the flowers a few times. 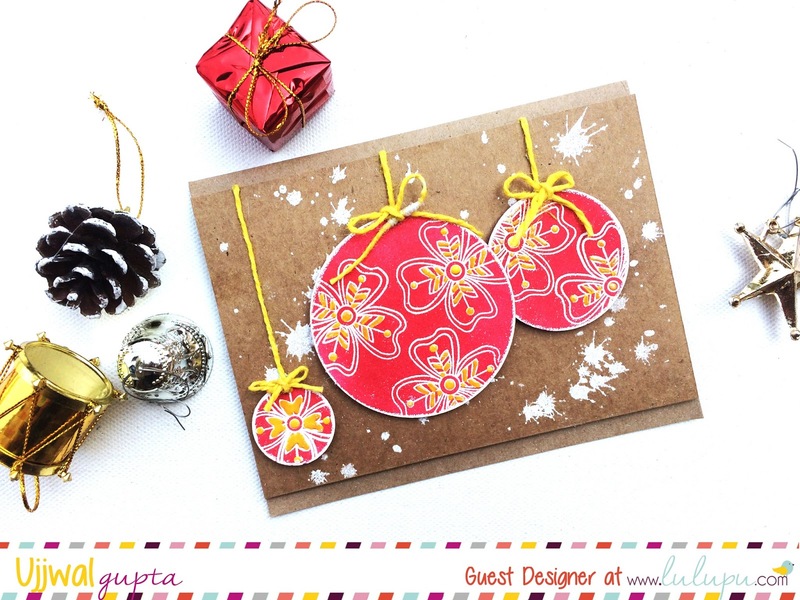 Step 4: Using 3 different sizes of circle punches, punch out 3 circles with the heat embossed pattern. 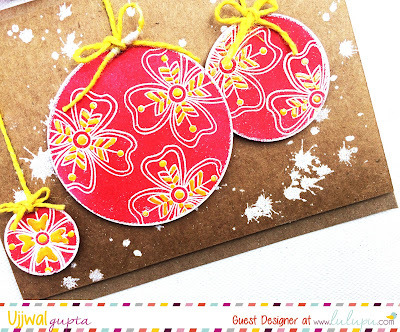 Step 5: Color the punched out circles using Festive Berries Distress ink and sponge applicator. 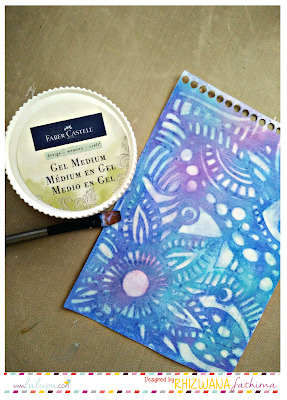 Step 6: Apply versamark embossing ink to the edges of the circles and white heat emboss them. 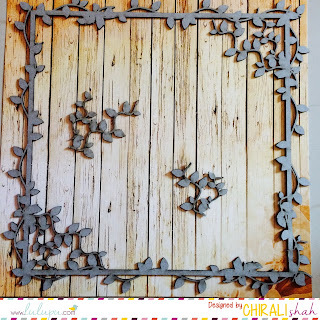 Step 7: Arrange the circles of the Kraft panel that was created in step 2 using foam adhesive. Step 8: Add twine and twine bows to the circle to make them look like ornaments. 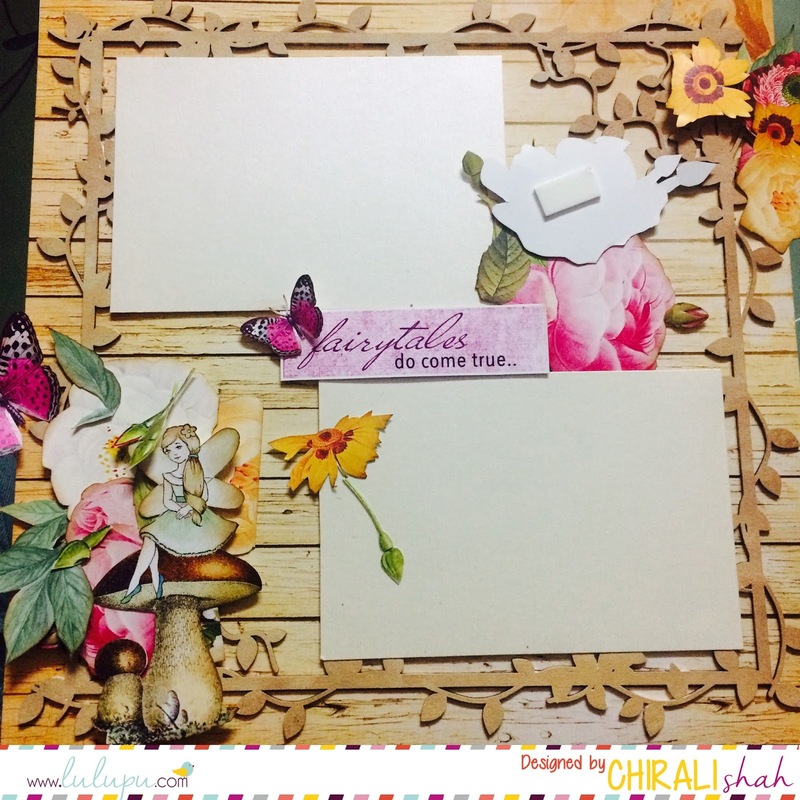 Step 9: Mount the Kraft card panel on a Kraft card base using foam adhesive. 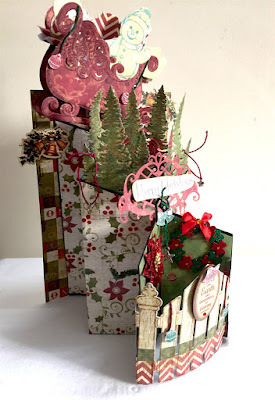 I hope you feel inspired to use the stamps in your stash and create some holiday cards this season! I just love these cards! They are so bright and festive! Thanks so much, Ujjwal for accepting our invitation to be our GD. That is it for today dear friends. See you soon again! Have a very Merry Christmas everyone! See you! 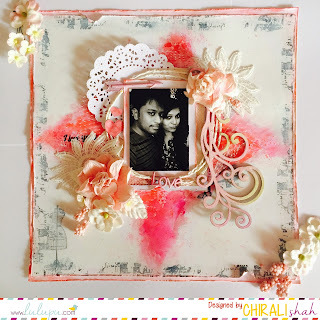 Chirali here with the very last post as a DT. Lulupu was the one whogave me a chance to become a spotlight designer twice and Design Team Member (My very first) and that too within one year of the beginning of my crafting journey. 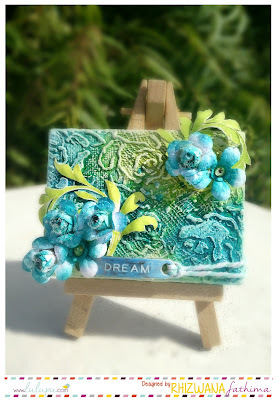 I can't thank enough to Karuna for such a big opportunity for which any crafter dreams of. So, today I am going to share a very quick layout which one can make in no time. It includes lots of fussy cutting and that's it (almost ;)). I cut all the things i wanted before starting with it. Random arrangement of fussy cut embellishments and started with sticking them. I adhered almost everything with foam tape to give 3D effect. I hope you liked this jungle kinda theme layout which is going to have two black and white photos of cute babies. I am going to cherish this period a lot not only because it was my first but also for such a supportive team. 1. 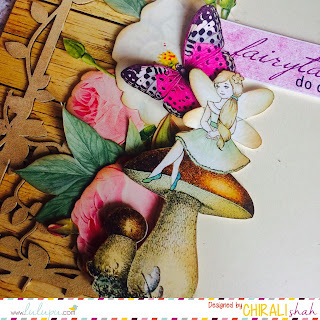 Fairy Land Premium Paper Pad 12"x12"